Why use a canine over a human for narcotic detection? Many business owners ask us - Why use a canine for narcotic detection instead of your current employees? Many people question what is behind a dogs gift of sniff. We get into everything below. After I am finished explaining, I am positive you will never use a human again to do the work of purebred, highly trained narcotic detecting K9. What gives the dog their gift of smell and how much better is a canine than a human? 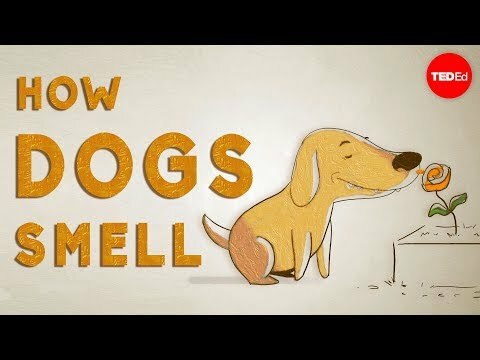 This puts into perspective how much more equipped a canine is in sniffing an odor than their human counterpart - it's not even close! Put another way, dogs can detect some odors in parts per trillion. What does that mean in terms we might understand? Well, in her book Inside of a Dog, Alexandra Horowitz, a dog-cognition researcher at Barnard College, writes that while we might notice if our coffee has had a teaspoon of sugar added to it, a dog could detect a teaspoon of sugar in a million gallons of water, or two Olympic-sized pools worth of water. Another dog scientist likened their ability to catching a whiff of one rotten apple in two million barrels. 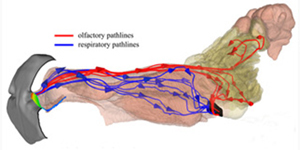 Figure 2: When a dog breathes in (far left), it can tell which nostril an odor arrived in because each nostril's "aerodynamic reach" (blue) is so small. When a dog breathes out (near left), the expired air blows out of the side slits in such a way as to augment the sampling of new odors. Clearly these are some astonishing facts. A human can take hours going through all the drains, rummaging through your client's clothing and personal affects. A K9 can easily sniff around and non intrusively detect any illicit substances that may be present. 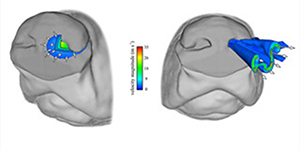 We now know a canine sense is at least 10,000 times that of a human. What does this mean for you? Peace of mind. A priceless stress reducer that will keep your business safe. With our deterrence program, we can assure you that no stone will be left unturned and your business will be a safer place to operate effectively. Our drug sweeping dogs are trained with the best skills in the county. Use us today!